Nothing makes me happier than a hearty breakfast or brunch on the weekend. Breakfast food is my favorite, especially when I’m eating out at a restaurant. You can get great breakfast food at home though too. I might not have cracked the trick to delightful, thick and fluffy French Toast but I feel like I have figured out the trick to delicious pancakes. 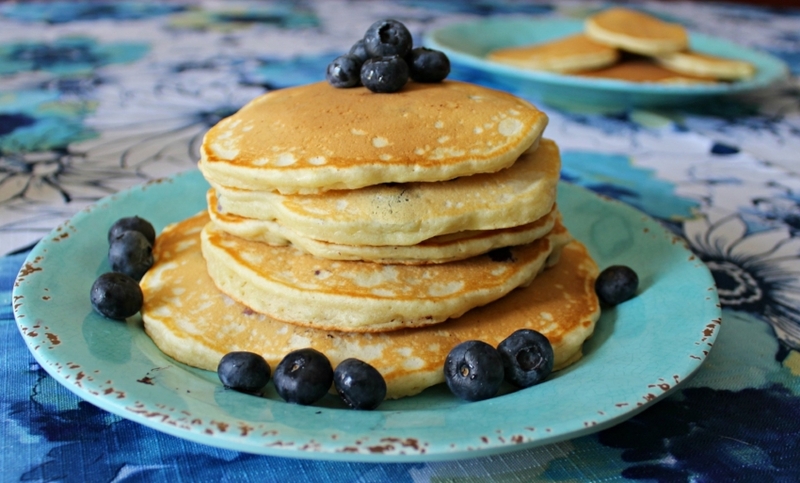 Take these Simple Blueberry Pancakes, for example. They’re fluffy, tasty, and don’t take too long to whip up either which is always a plus. They also freeze nicely for breakfast during the week if you’re so inclined. Pancakes are a pretty standard breakfast and brunch item. 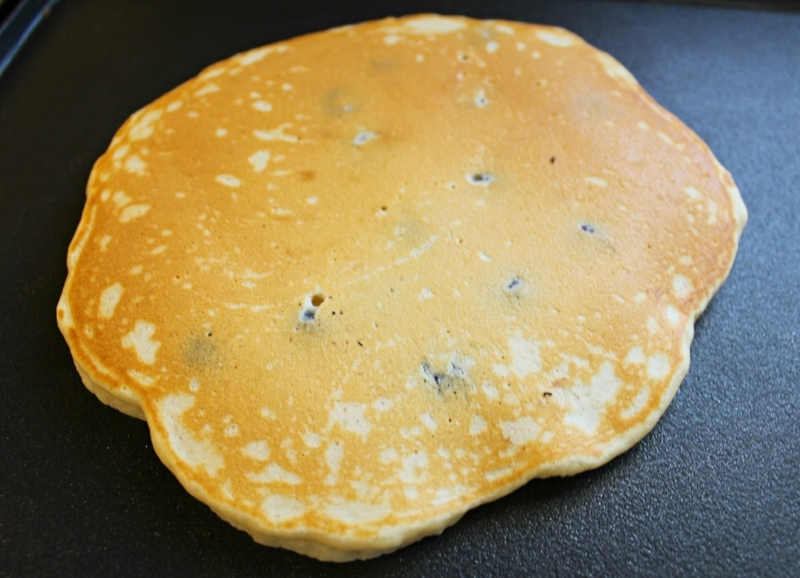 It seems that a classic Blueberry Pancake is often overlooked because of how standard it is. Do people even make them at home anymore? 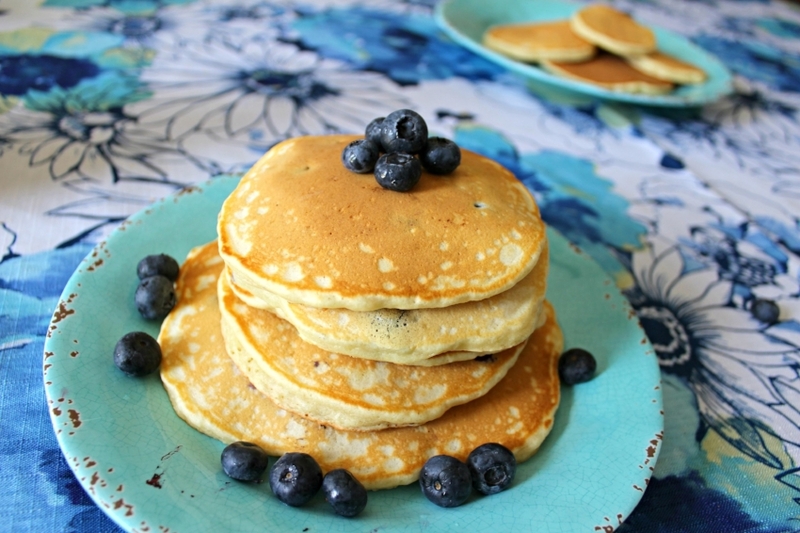 They’re so simple and a refreshing alternative to classic pancakes. It’s an easy way to mix up a standard breakfast on the weekends. The trick to great pancakes is butter...lots and lots of butter. Butter in the batter and butter on the griddle. The batter should also be somewhat clumpy. The ingredients need to be mixed but if you have a completely smooth batter, the pancakes won’t get as thick and fluffy. My final tip, a touch of vanilla goes a long way for flavor. It elevates the pancakes and adds an extra pop of flavor. For a richer pancake, buttermilk is also a good addition. You could substitute one cup of the regular milk with buttermilk but you don’t want to substitute all the regular milk out because you’ll get dry pancakes. And speaking of milk...you’ll notice a very specific measurement. One and three quarters of a cup of milk plus two tablespoons. This is no joke. I added more milk into the batter gradually until it reached the perfect consistency. The batter should be thick but not gloppy. It’s a very thin line you’re working when it comes to the batter consistency but I swear this measurement is on point. If you feel like the batter is too thin or too thick, feel free to add a little extra flour or milk but only a little at a time, I'd say no more than a tablespoon. Sometimes the environment can have an effect on the consistency of the batter so it can vary. Or, maybe you just have a different pancake preference which is perfectly fine too. I'm having brunch at a restaurant this weekend with an old friend of mine. It'll be the perfect way to kick off my birthday and the restaurant came to me as a recommendation. The menu looks fantastic and the restaurant has a rooftop so I'm kind of hoping for cooler weather so we can enjoy it. It tends to cool off for my birthday even if we're mid-heat wave. I think it's the universe's way of giving me a break, even if just for a day. So tell me, do you make blueberry pancakes at home? Any pancake making trips up your sleeve to share? 1 ¾ cups Milk + 2 tbsp. 1 - In a large bowl, mix together the flour, sugar, baking powder, baking soda and salt. Add in the milk, butter, vanilla, and egg. Mix until everything is incorporated. The batter will be smooth for the most part with some clumps. Clumps are good because they’ll keep the pancakes fluffy. Fold in the blueberries. 2 - Heat a griddle over medium-high heat and add the reserved tablespoon of butter. Once melted, use a spatula or pastry brush to spread it over the entire surface of the griddle. 3 - To make the pancakes, ladle about ⅓ cup of the batter onto the griddle. Leave an inch or so between the pancakes so it’s easy to flip them and move them around. Once the batter is on the griddle, wait for it to bubble up and flip. Gently press the pancake down after a few minutes. If it springs back up quickly, you’re good to go. If there’s still an impression, let it cook a minute or so more. 4 - Continue the process until all the batter is gone. Serve!